Industrial Sales - Trust You! Industrial Sales – Trust You! “Trust“: Is a firm belief in the reliability, truth, ability or strength of someone or something. “Trust” is the third leg in the model of Success and it's one of the most important. Trust takes time and demand commitment. It's not a “switch” that can be turned on and off depending on the circumstance. It starts from the Heart and is demonstrated in Action. Let's GO BIG and commit to developing Trust! 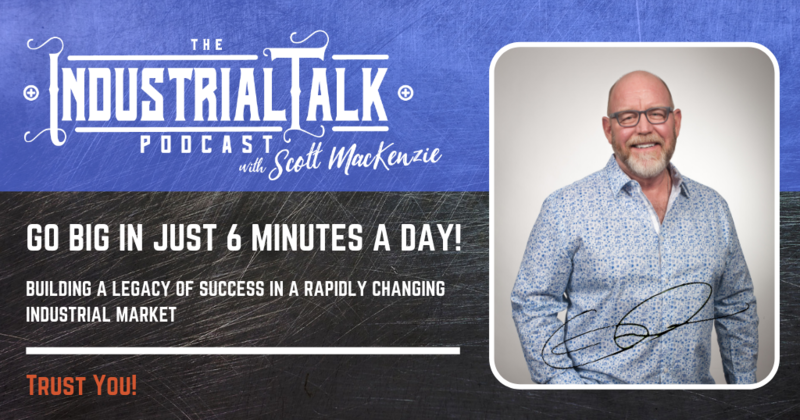 [00:01] The industrial talk podcast go big in just six minutes a day, building a legacy of success in a rapidly changing industrial markets. Alright, welcome to the industry. We'll talk podcast. We are going big. This is a series. This is number 15 in this series of going big and just six minutes. I'm going to try to honor that time as much as I possibly can. All right, let's get going. [00:23] Going to be talking about trust. Trust you. We develop, know, like and trust, right? We're going to be talking about caring and friendship right now. We're going to be talking about trust and I'm going to be talking a little bit about the elements are the components of trust because trust is earned, right? It's one thing to know somebody because we can. It's another thing to like somebody because I know that I'd like people and I like people that I don't trust, so you've got to pull all these components together, right? And that's what's so important is that we start to pull it all together because we're all about here at the industrial talk podcast. We're all about your success. The content that you need to be success full and um, it's really important to be able to constantly focus on that. So let's talk a little bit about trust. [01:12] What does that mean? What are the components of trust and what do we have to do? So what I've got, I've got a six components of trust. Now there's going to be more. Don't get me wrong. There's, I mean there's, there's tons of elements. What, what I'm trying to do is give you the content of being able to, um, pull that together, think about it and expand when you think you need to expand. But we're trying to get to tous trust. So let's talk a little bit about time. Time is an important component of trust. If I'm there on time, focused with my commitments, I'm developing trust. That's time, right? I, I, if I did not, if I sat there and I came late at that show to a level of, well, you know, I'm not really at interest in what you are doing. Customer. [02:05] That's also an indication. Do I trust them or are they dealing or are they there on time? To their commitments. So time, important tay standards, you know, am I, am I holding the meetings? Am I, am I clear? Am I, are my standards of performance consistent standards? Uh, do I, do I do something different than the next day? Do. Am I an inconsistent in my messaging, my direction, my leadership approach? Standards are important. So what we have is time we committed in our time. We have our standards were very consistent. So people who know us, St. Yep, he does that. Scott does that, she does that. Whatever it is, and they're consistent. There's a level of comfort and a level of, of just trust that that's going to happen. The next one is competence. Now we've talked about that. That's, that's you. You got to, you've got to educate yourself. [03:12] You've got a constant. And the information is out there, right? You don't have to, you don't have to sit there and try to wing it. The information is available. Somebody. And I mean somebody has that information that could help you continue to grow. Right? Okay. So that's pretty straightforward. We've got time, we've got standards, right? And now we're, we're studying, we're competent, and then we're involved bringing attitude and, and concerns in, in, into the relationship. Right? And I'm looking over my notes, so I get this right, and we're, we're, we've got a compassionate presence. There's, there's, there's, there's truth to what you do. That's real important. So we're trying once again to build that, these components of trust, which is, you know, for me it's, you know, some days, you know, when we just, we just, we just got to recognize it and put it on our, in the front of our mind. [04:13] Right? And that's, that's involvement. And now sincerity, you know, when we talked about last night or yesterday, we were talking about sincerity and that is being genuine in the action and interactions with people. Are you genuine? Are you sincere, are you authentic? And, and, and that's real important because I know that I like to hang out with people who have my best interest at heart. I have your best interests at heart and I truly hope you get that through these conversations. And then what we have here is reliability. I'm going to keep my promises. I'm keeping my promises, I'm not going to, if I say what I'm going to do and mean what I'm going to do and I'm going to commit to that time, I'm going to do everything and I'm not, you know, sometimes we do commit to stuff and we, you know, we don't hit our targets. [05:11] However, here's the reality. I can always go up because I am, I'm developing that, um, that component of trust. I can always go back to the person that I've promised something to and say, Hey, I'm sorry I'm going to be late. Here are the reasons why and have that conversation. Right. Once again, I'm going to, I'm going to summarize that. We're talking about time, we're talking about standards, we're talking about competencies. You've got to study, do it. It's all out there. It's available. We've got an involvement. We, we've got a heart for their success. We've got a sincerity, sincerity, to be able to truly be genuine. And in this. And uh, finally we reliable. We meet what are, say what we say. So no liken trust. We've got the no, we've got the like, we've got the trust. And I'm telling you, he got to pull those things together so when you, you know, get out there, get people to know, you, get out there, beer factor like and then of course definitely trust. And once those things come together, then you can start to develop that, that position of caring and friendship and, and I'm telling you, the sky's the limit when it comes to that stuff. Okay? We're good elements or components of trust. [06:35] I really enjoy the fact that we get to spend this time together. I'm about you. I'm about helping you in everything that I can possibly do. You can go onto my website and it does talk and you can go and find out more information. Contact me. I want to help you. Everything that I can possibly do. Have a great morning, afternoon, night. I don't know when you listen to it, but have a good one. Be Safe, always be safe. So thank you again for joining the industrial tech podcasts. I will talk to you tomorrow.